Conservation planning is “the process of making informed conservation decisions” . It is particularly important given the scale and complexity of policy and institutional agendas when it comes to spatially allocating resources. An approach to conservation planning that has received widespread interest for its evidence-based approach amongst academics [2, 3], conservation organisations [4, 5] and government departments [6–8] alike, is the discipline of systematic conservation planning . Systematic conservation planning emerged in the 1980s and 1990s as a response to the tendency of conservation decisions to be made in an ad hoc manner. The majority of terrestrial protected areas were designated in places that were steeply sloped or otherwise unsuitable for agriculture, rather than where biodiversity was highest and most in need of protection [10, 11]. 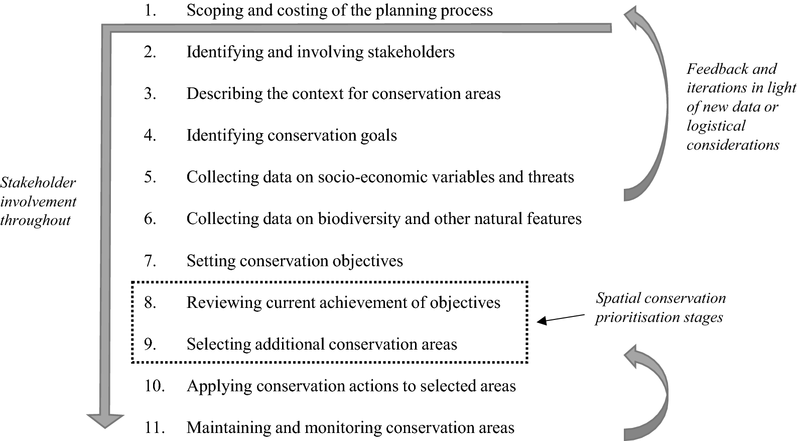 Systematic conservation planning built on ranking approaches, popular before the early 1980s, by incorporating quantifiable objectives and enabling assessments of trade-offs between competing conservation and cost-effectiveness considerations . Ecological principles such as representation and persistence are central to systematic conservation planning . Terminology has changed over time (for political expediency; Pressey, in prep) since the CAR (comprehensiveness, adequacy, representativeness) principles that first drove the discipline. Here, representation refers to the extent to which a set of reserves samples the full biodiversity of a region (combining both the original uses of comprehensiveness and representativeness). Persistence (originally framed in terms of adequacy) means the long-term survival of species or other elements of biodiversity, including diverse natural processes at a variety of scales , often approached through connectivity of multiple species and habitats across landscapes and seascapes. Systematic conservation planning proposes a structured, consultative process for choosing between, locating, configuring, and implementing conservation actions, often involving input from policy makers, land managers and resource users. Conservation objectives are specified quantitatively, in one of two ways . First, and most commonly, objectives are expressed as threshold amounts of natural features relative to a baseline. An example is to cover at least 20% of each vegetation type, with no explicit added benefit for amounts over 20%. Second, objectives can be defined as continuous functions that accrue benefit up to 100% coverage of features. The outputs are optimal or near-optimal sets of spatially-bounded conservation actions [15, 16] (Fig. 1). During the planning process, spatial conservation prioritisations (also called conservation assessments) are conducted, often using decision support software such as Marxan , Marxan-with-Zones , Zonation , and C-Plan  (Fig. 1) to sort through the vast number of potential spatial configurations. While often equated with systematic conservation planning, prioritisations are analytical exercises making up only a subset of the overall process . Rigorous evidence is central to systematic conservation planning. This generally includes spatial data for biodiversity or environmental surrogates  and socio-economic cost predictors such as land acquisition costs or willingness of landowners to support proposed conservation activities . Plans often also include assessments of vulnerability to future climatic regimes  and analyses of scheduling conservation actions over time . The discipline of systematic conservation planning has had a major influence on conservation planning practices globally. It is used extensively by environmental organisations and government agencies alike . Thousands of academic publications focus on the discipline, a trend that appears to be increasing [2, 24]. Marxan alone had over 6700 users from 184 countries between 2011 and 2016 . Efforts are currently underway to centralise records about where systematic conservation plans have been developed , as the number of total plans is currently unknown. This type of planning is resource intensive and can cost millions of dollars over several years . Despite the influence of the discipline and the importance of evidence when developing plans, there is very little rigorous evidence about whether systematic conservation planning is effective at improving biodiversity conservation outcomes . A compilation of such studies is therefore much needed. This study outlines the results of a systematic mapping exercise to comprehensively assess the published literature on the effectiveness of systematic conservation planning . Systematic maps are typically precursors to systematic reviews, and involve collating, describing and assessing the quality of studies assessing a particular intervention . To our knowledge, this is the first systematic map of a planning intervention in the environmental sciences, and it introduces a new set of challenges in evidence availability and interpretation. Interest in this topic is not new and this study follows a preliminary protocol for a systematic review lodged with the Collaboration for Environmental Evidence in 2008 . 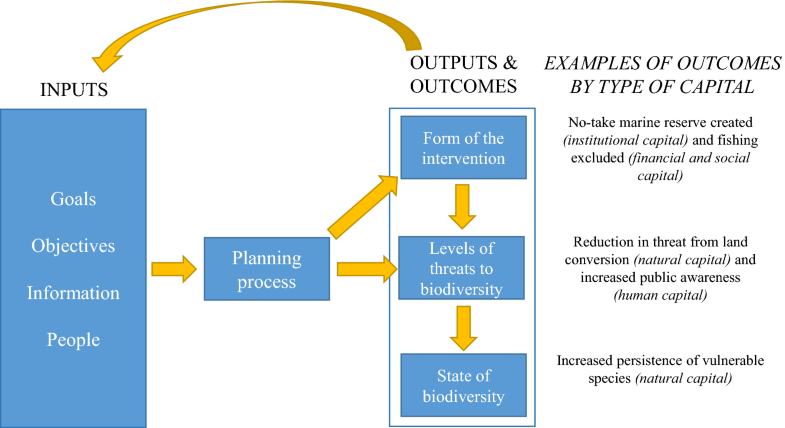 Our conceptual understanding of how systematic conservation planning interventions can lead to outcomes in terms of natural, human, social, financial and institutional capital is illustrated in Fig. 2 and expanded in Table 1. This theory of change is deliberately simple, to illustrate the potentially broad range of outcomes currently assumed to result from systematic conservation planning exercises . Multiple pathways and mechanisms are likely to link systematic conservation planning to these outcomes, but these are not yet consistently defined. Our decision to report outcomes by five types of capital follows an earlier application of this framework to conservation planning  and related disciplines, e.g. . For further details, see our published protocol . Potential outcomes of systematic conservation planning arranged according to capitals. Subject experts (ranging from academic researchers to staff in environmental NGOs responsible for conducting systematic conservation plans) were consulted throughout the protocol development, searching and analysis stages. This occurred in several ways. Calls were put out for comment at relevant conferences and workshops, alongside presentations and posters about the project. Subject experts were also invited to share potentially relevant studies (see methods) and this usually led to email or phone discussions about the research and findings, as well as recommendations for additional contacts. We sought to identify retrospective studies that measured the effects of systematic conservation planning exercises on biodiversity conservation at various scales. Our primary research question was: What is the extent and distribution of evidence on conservation outcomes of systematic conservation planning around the globe? The definitions used to focus our search are provided in Table 2. What are the characteristics of the current evidence base, including study location, scale and study design, intervention and outcome type? What types of outcomes of systematic conservation planning exercises are measured, either by the original planning organisation(s) or others? How robust is existing evidence? How many impact evaluations have been conducted, where and by whom? Our systematic map protocol has been published in Environmental Evidence  and this section includes updates since that publication. Updates include the use of the software CADIMA, consistency checks prior to every screening stage and abandonment of an attempt to undertake the bulk of screening by one reviewer (up to six were involved in the most time-consuming stages). Also, no evidence matrix was produced due to the small sample size. Further details have been provided in related sections of the methods. A search string, consisting of subject- intervention- and outcome-related keywords combined using Boolean logic and wildcards, was used to query publication databases, search engines and online repositories (Table 3). Searches were conducted in February and March 2017. Unless otherwise indicated, searches were conducted for studies produced between 1983 and 2017 inclusive, in English only given resource constraints. Publications with full-texts not in English were listed and recorded separately for future iterations of the map or for other interested parties to pursue (see “Results”). To ensure wide coverage of potential peer-reviewed academic publications and grey-literature publications , we searched three publication databases, one search engine, three online repositories, and 21 organisational websites (Table 4). Studies were also identified opportunistically, via calls for papers at major international conferences, backwards and forwards citation searches of included studies (in March 2018) and use of review papers to identify related primary studies. Subject experts were contacted to confirm no key references were missed. These individuals were identified primarily by their roles as conservation planning experts within global conservation NGOs, such as Conservation International, and prominent national organisations, such as the South African National Biodiversity Institute, and through snowball sampling (many recommended additional subject experts). Experts also included academics whom the authors knew had an interest in this topic. The detailed protocols employed to search each source, including tailored approaches to individual databases and suggestions from subject experts, are outlined in Additional file 1. For both searches, the first 1000 results were retrieved using the software Harzing’s Publish or Perish . Following the searches, article citation details and abstracts were extracted in.ris form (or converted to.ris form using a freely accessible conversion template developed for our purposes by the EPPI-Centre ). When searching websites, the web scraping software Parsehub (https://www.parsehub.com) was used to extract records [35, 36]. Settings were tailored to each website and details are provided in Additional file 1. Results were initially imported into the software EPPI-Reviewer (V.4.5.1.0 ), which was used to detect and remove duplicate articles. Prior to title screening, duplicate checked results were imported into the systematic review management software CADIMA . Articles were screened in three stages: title only, abstract, then full-text. When screening articles for relevance, a series of inclusion and exclusion decisions were consistently applied (Table 5). Regular reviewer team meetings were held throughout all screening stages to ensure criteria were being applied uniformly, and detailed decision rules were tailored for each screening stage in these meetings. During our discussions about definitions of systematic conservation planning and tightening the inclusion criteria, we revised our original positions and excluded several studies we had expected to include at the protocol development stage (from the test library, including [7, 39, 40]). If there was any doubt about the relevance of an article, it was included for evaluation in the subsequent screening round to avoid removing potentially relevant studies. Two of the authors (MCM and RLP) have published extensively in this field so were not involved in article screening to reduce the likelihood of authors reviewing their own work. Studies were included if they reported on changes in the condition of one or more types of capital, as a result of a systematic conservation planning. Prior to commencing each screening stage, inter-reviewer consistency checks were conducted with the reviewers involved at that stage. A subset of the same titles/abstracts/or full-texts were screened by all and results were compared using Cohen’s Kappa (k)  (more details below). This exercise was repeated, and inclusion rules clarified, until the desired level of consistency was met (threshold k value of 0.5 at title screening and 0.7 for abstract and full-text screening). These k values exceed recommended guidelines . After this, screening formally started (the articles used in consistency checks were included again in the overall screening). Articles were randomly divided between the reviewers and were not duplicate screened (except those marked as unsure, and at full-text extraction stage). Articles provided by subject experts were automatically included for screening at full-text. For title screening, four rounds of consistency checks were required, involving 200 randomly selected articles each time (800 titles total). Rounds were iteratively undertaken using CADIMA until screening decisions were above the k = 0.5 threshold. Publication titles were reviewed in CADIMA by two reviewers in accordance with the inclusion and exclusion criteria. Due to limitations of CADIMA (not allowing changes to the size of a reviewer team at different stages ), EPPI-Reviewer was used for abstract and full-text screening. Missing abstracts were entered for included articles. Six reviewers participated in abstract screening and five rounds of consistency checks were conducted, each involving 25 randomly selected articles, until results exceeded the k = 0.7 threshold (125 abstracts total). Full-text files were downloaded or accessed in hard copy through the Bodleian Libraries at the University of Oxford. Full-text articles were divided between and screened by three reviewers following six rounds of consistency checks (where 20 articles were screened by all three reviewers each round), until results exceeded the k = 0.7 threshold (120 full-texts). Reviewers included articles focusing on those with relevant subject, intervention, outcomes, comparator and study designs (Table 5). Articles were included only when all five criteria were relevant. Where insufficient information was provided to determine if the intervention met our definition of systematic conservation planning, further information was sought before reaching a decision, such as by following up cited references about the original plan. Any articles the reviewer was unsure about were flagged as ‘unsure’ and were discussed with the other reviewers prior to reaching a decision. Given inconsistencies in the use of the term “systematic conservation planning” , those studies for which the “intervention was similar to, but not systematic conservation planning” (according to our definition, Table 5) were marked as such. This provided estimates of the number of spatial conservation prioritisations and other related exercises detected. Review papers were also set aside, and the studies therein were assessed for relevance. Relevant studies were extracted from the included articles (where multiple studies were included in a single article). For example, a single paper often reported on multiple planning instances. The included studies were categorised by two reviewers according to a data coding template (Additional file 2) and any differences in coding were discussed and a third reviewer involved if necessary (undertaking kappa analysis was unnecessary at this stage due to the small sample size). Coding involved outlining bibliographic details, background information including location of study and broad objectives of the plan, study design, reported outcomes and context . Information about the study design of relevant articles was recorded to determine study robustness, in place of critical appraisal. Where possible, the categories of the data coding template were updated to match those underlying a new database of marine spatial prioritisations  to make the two databases cross-compatible. Where necessary, we contacted authors of included studies for additional information (via email or phone). Our finding of fewer than expected evaluations in the published literature meant the development of an evidence matrix and geographic map of included studies (as proposed in the protocol) was not possible. Instead we provided a narrative assessment of the available literature, gaps in our current state of knowledge and suggestions for how to fill these. Procedural independence was managed by excluding co-authors with publication records in systematic conservation planning (MCM and RLP) from the screening process. In total, 15,054 results were retrieved from the 29 sources searched, including 5228 duplicates (Fig. 3; details in Additional file 1). A further 232 previously unscreened articles were screened based on forwards and backwards citation searches of the included studies (Additional file 3). After duplicates were removed, a total of 10,058 articles were screened by title, 5221 by abstract and 1209 by full-text. Of those included for full-text screening, 236 were either not in English or not accessible (Additional file 4). Where neither hard copy nor digital copies were found through Oxford University’s Bodleian Library or Google searches, digital copies were requested from authors via ResearchGate.net. Most of the remaining search results unavailable by full-text had incomplete citation details or were conference abstracts without associated full-text publications. Reasons for the exclusion of the remaining 970 articles were recorded (Additional file 5). Seven articles were excluded outright because they were marked as reviews of systematic conservation planning evaluations (Additional file 6). If an article was excluded on one or more inclusion/exclusion criteria (Table 5) it was not included. All criteria were assessed, and most articles were excluded based on multiple criteria (Fig. 3). 893 articles were excluded on intervention, 186 of which were deemed “intervention is similar to, but not systematic conservation planning”, meaning they were either solely spatial conservation prioritisations (a computational component of systematic conservation planning), or approximated the stages involved in systematic conservation planning but did not involve the spatial conservation prioritisation stage . Of the 69 studies included on subject and intervention (representing a systematic conservation planning intervention at a relevant scale, Table 5), 23 were excluded on outcome because they reported on the design and implementation of a systematic conservation plan but did not provide any details about consequences. In some cases, for example, at the time of publication it was too early to report whether the plan was implemented. This left 43 articles included on subject, intervention and outcome but excluded on study design and comparator. Only three articles were included based on all criteria (Additional file 7). One of these had been provided by a subject expert and the other two had been retrieved through publication database searches. One of the included articles reported on multiple different types of planning instances, but we extracted three relevant studies across the three articles. Additionally, 142 articles were included on subject, study design and comparator but excluded on intervention and outcome, all of which related to formal evaluations of environmental management interventions, but not systematic conservation planning specifically. Coded data extracted from the three included studies is presented in Table 6 according to a standardised data coding template (Additional file 2). These impact evaluations were undertaken by NGOs and universities. In two studies, the same organisations undertook the evaluation as had developed the plan(s) in question. Did the project outcomes reflect achievement of the original plan vision statement? Is the lead organisation the same as that which originally conducted the planning process? Theory of change or conceptual model (for how the plan was expected to lead to intended outcomes) included in the study? Fisher and Dills  reported on ecoregional assessments conducted across the USA, which were based on systematic conservation planning principles . The authors explored the relationship between terrestrial areas prioritized for biodiversity conservation by an environmental NGO (The Nature Conservancy, TNC), and those acquired for protection by the NGO over several decades. Lagabrielle et al. outlined a terrestrial planning process for the island of Réunion which was conducted in parallel with the revision of a regional development plan. The evaluation approach was largely reflexive, comparing a planning attempt involving systematic conservation planning (which they referred to as sequence 2) and another where agent-based modelling and companion modelling were used to explore future land-use change scenarios (sequence 3). Álvarez-Romero et al. compared seven marine conservation planning exercises undertaken over a 15-year period in the Gulf of California, Mexico. One of these plans met our definition of systematic conservation planning (the Ecoregional Assessment ) and it alone is the relevant study discussed here. Experts on regional marine conservation issues were surveyed and asked to identify planning goals, the extent to which these were achieved and how planning outputs influenced implemented conservation actions. Two studies were conducted at subnational scales and one nationally. The areas of interest ranged from 2500 km2 to over 300,000 km2. Two studies concerned the terrestrial realm and one marine. We classified all three intervention types as aiming to ‘identify priority conservation actions’. None were intended for direct application. The objectives of all studies included biodiversity, ecological processes and species persistence and two also included other considerations, such as fisheries, agriculture and urban planning. Stakeholder engagement most commonly involved consultation, and in one instance also negotiation. The duration of the planning processes and associated costs were unclear in all three studies. All included studies reported institutional outcomes, two also reported on social and human outcomes, and only one reported any financial outcomes. None reported natural capital outcomes. Examples of outcomes included sharing of knowledge between stakeholder groups and a greater awareness of the complexity of urban planning amongst participants  and influence of the planning process on future decision making by the organisation or partners [43, 46]. Two of the three studies reported on whether the project outcomes reflected achievement of the original plan vision statement, and both reported the vision had been achieved. None of the studies provided theories of change or a discussion of how they expected the plans to lead to potential conservation (or other) outcomes. Only one stated a hypothesis for the evaluation. Two studies involved non-experimental study designs where the method of attribution was correlative. The other was qualitative, and attribution was based on researcher inference. One of the included studies  originated from the call to subject experts, but unlike the other included studies, had not been returned in the searches of publication databases (all included studies had been published in indexed journals). To explore the reasons for this, a review of the original search string was conducted in Web of Science Core Collections on 24/01/18 (Additional file 8). This confirmed the intervention and outcome search terms were appropriate, but the subject terms were not sufficiently diverse. By adding the term ‘protection’ to the subject terms, the missed article  was returned in the new search, along with 342 additional articles compared to the original search string (excluding a further 563 articles added to Web of Science in the 11 months since the original search). This finding can be used to help better design future searches (see “Discussion”). However, the 342 studies were not screened for relevance and none were included in the study since we would for parity necessarily have to have to repeated searches across all 29 sources beyond the original March 2017 cut off. Faced with prioritizing limited resources for biodiversity conservation, conservation planners are increasingly turning to systematic conservation planning tools and techniques. Their aims are to explore financially and socially acceptable trade-offs, whilst seeking to optimise representation and, usually implicitly, the persistence of species and habitats . In this study, we collated articles on the application of systematic conservation planning and the outcomes of related plans. The aim was to assess the evidence base rather than produce meta-analyses or detailed syntheses. Despite retrieving over 10,000 articles from traditional academic and grey literature sources, only three studies were found to contain robust evaluations of this extensively applied intervention type and none that reported evaluation of natural capital outcomes. This highlights an important evidence gap, particularly given the amount of interest in systematic conservation planning and the significant cost of undertaking plans . This is a null result, rather than a negative finding and was not completely unexpected, given the barriers to undertaking evaluations of complex interventions . As stated in our original protocol, “a finding that no or few impact evaluations have been undertaken on systematic conservation plans would highlight an important gap in evaluations of the technique to date” [15: 4]. Rigorous Collaboration for Environmental Evidence guidelines  were used to identify three relevant studies, that provide valuable insights into how plans are conducted and how outcomes can be interpreted. However, the studies did not conform perfectly with our inclusion criteria, particularly in relation to comparators and study designs. The below considerations highlight the difficulties of interpreting studies of planning interventions, as well as the prevalence of incomplete records and challenges when attributing outcomes to complex interventions. The three included study designs differed greatly and demonstrated the importance of understanding regional contexts and of interpreting results with care. Fisher and Dills  undertook a meta-analysis, the assessment of a planning campaign over several decades, rather than assessments of individual plans and the causal processes that led to the outcomes of those plans. The authors were not able to provide conclusive evidence that systematic conservation planning influenced land acquisition decisions, but this finding masked the complexity underlying the value of the formal ecoregional assessment processes. While they did find that the land acquisition patterns by TNC were positively correlated with priority areas in all states across the USA, no difference was observed in land acquisition patterns before and after systematic ecoregional assessments were implemented. Rather than a before/after analysis, Álvarez-Romero et al. compared seven different approaches to planning in a single region, five of which approximated systematic principles although only one met our definition of systematic conservation planning. The plans overlapped spatially and temporally to some degree, and the authors employed both quantitative and qualitative data collection methods. The six plans that did not meet our definition of systematic conservation planning are not ideal counterfactuals for the relevant plan given that datasets and experiences from earlier plans often influenced subsequent planning processes. Furthermore, these plans were not explicitly contrasted to the relevant plan in the results, as data were aggregated across all seven plans. Use of a survey methodology facilitated an assessment of how goals, outcomes and spatial areas recommended for protection differed between the seven plans. Surveying people one step removed from the plans in question provides an example of how to limit bias when reporting on planning outcomes. The third included study by Lagabrielle et al. was considered borderline in terms of constituting a qualitative study design in part because it directly reported on the opinions of the authors, with little explanation of causal links or justifications for reported outcomes. We included it because the authors considered the “researcher’s posture in the participatory modelling process” [45:1425] and therefore attempted to recognise potential biases. They provided thoughtful reflections on the scientists’ role in the process, and comparisons between the experience of conducting a systematic conservation planning study using Marxan, with a process where stakeholders co-created models and planning outputs with scientists. Another article we screened, by Carter et al. , provides a valuable example of how to conduct an evaluation of the outcomes of conservation plans, even though it was not included. The authors quantified land management actions (i.e., changes in the amount, location and land cover type of protected areas) in relation to individual state land management plans in Wisconsin, USA. They found that land protection activity increased in prioritized regions after plans were released, an effect that was high for local land protection projects but weak for broader, state-wide plans (a finding consistent with that of Fisher and Dills ). They also noted that most actions occurred within the first 5 years after a plan was released and decreased over time. Two plans discussed in this article were similar to systematic conservation plans but were excluded on intervention and outcomes. It remains an insightful article, exploring the causal pathways by which plans may influence conservation actions. Overall, we identified 43 studies with relevant subjects, interventions and outcomes, but which we were unable to include due to unsuitable study designs and comparators (Additional file 2). In general, the evaluation strategies were not sufficiently rigorous for inclusion, or to independently verify claims. This is not uncommon in studies of environmental interventions [50, 51]. Despite suggestions that conservation experts are unaware of how to conduct high quality evaluations , recent research suggests the main barriers to undertaking such studies relates to a lack of funding and time constraints, as well as availability of baseline data, lack of forward planning, and availability of a suitable control group . Four studies were excluded by comparator only [7, 31, 52, 53]. Authors of similar systematic maps have occasionally been flexible on screening by comparator , noting it is particularly unusual and challenging to employ use of comparators in multidimensional interventions such as planning. Instead we have been clear about the fact that our included studies do not perfectly match the inclusion criteria and list our reasons for exclusion (Additional file 5). The plans underlying all three included studies varied in the degree to which they met our definition of systematic conservation planning. For example, in Fisher and Dills’ study  the methods underpinning TNC’s ecoregional assessments  draw heavily from the systematic conservation planning literature. The use of spatial conservation prioritisations and computational decision-support tools is promoted by TNC, but is not mandatory, in contrast to our definition of this intervention (Table 5). We were not able to determine what proportion of ecoregional assessments in the included study involved the use of computational tools, and the authors acknowledged this type of information was not always available. Very few full-text articles met our specific definition of systematic conservation planning (n = 80). Our definition is heavily drawn from the academic literature and may be better interpreted as a set of guidelines, rather than a distinct intervention. Groves and Game  recommend that conservation planners decide on which tools to include within a planning process depending on their specific needs, available funds and teams’ skill sets. It appears that this is a better representation of how planning processes are conducted in practice than the 11-step framework we used to help define the intervention (Fig. 1). The latter may be better interpreted as a list of components from which planners pick and mix. However, expanding a study of this nature to include all conservation planning studies that are systematic to some degree would introduce high levels of variation, making comparisons extremely challenging. For these reasons, it may be appropriate to review strict definitions of systematic conservation planning, including our own. Alternative conceptualisations of conservation planning as an intervention may be required. In addition, research is warranted on the relative benefits and limitations of following some, rather than all, planning stages of outlined in Fig. 1. This systematic map illustrates how rarely evaluations of systematic conservation plans are published. Yet, despite their novelty, none of the three included studies was published in the most common journals associated with the discipline. According to a review conducted in 2012 , the three journals with the greatest number of articles on systematic conservation planning are Biological Conservation, Conservation Biology and Biodiversity and Conservation. Citation searches in Google Scholar revealed our three included studies have been cited between 18 and 65 times over the 5–8 years they have been in publication. This is low in comparison with a seminal paper on systematic conservation planning, cited over 4500 times since 2000 . Our results corroborate claims that the literature on systematic conservation planning is dominated by methodological studies, rather than those that focus on implementation and outcomes, and support the case that this is a problematic imbalance in the literature . Spatial conservation prioritisations made up the majority of the 186 studies we marked as “intervention is similar to, but not systematic conservation planning”. These were generally undertaken as hypothetical exercises or to propose a methodological innovation, rather than being linked to a broader planning and implementation strategy. Given estimates of the number of published prioritisations (e.g. 160 in the marine realm alone ), our finding of 186 related studies is lower than expected. This may be because we included evaluation terms in the search strings and excluded articles that were clearly only spatial prioritisations at the abstract screening stage. Several authors acknowledged that they specifically decided not to conduct spatial conservation prioritisations as part of their (otherwise systematic) planning processes [56, 57]. Kirlin et al. explained “this technique [use of Marxan software] was explicitly rejected in the initiative as inconsistent with the legal requirements… regarding network design and not sufficiently transparent to policy makers or stakeholders” [56:4]. Lagabrielle et al. also stated that they had to abandon a planned aspect of stakeholder consultation alongside their development of prioritisations in Marxan because “…this tool embeds strong hypothesis about land-use management and conservation, such as, for instance, the attribution of a value to biodiversity features. The participants globally disagreed with this approach and thus rejected the tool” [45:1424]. Another insight revealed in this study was the high number of plans that focused on reporting the representativeness of protected area networks (or similar) rather than measures of species’ persistence or other measures of impact (and therefore had to be excluded). A protected area network might contain representations of each habitat type, but still fail to ensure species persistence, perhaps because of the inadequate size of, or connectivity between, habitat patches or inadequate representation of the habitats most in need of protection . Too narrow a focus on representativeness in systematic conservation planning risks plans failing to secure healthy populations and species as intended. In a recent survey, conservation planning practitioners reported much higher rates of plan implementation and downstream outcomes than is observable in the published literature . This finding is supported by unpublished outcomes provided by the lead author of one of the included studies “Our research worked so well (in terms of impacts) that I was recruited at the university of Réunion Island and the PhD co-student I worked with… is now in charge of developing and monitoring official regional land-use and risk management plans for the Regional Councile of Réunion Island” (Personal communication, Erwann Lagabrielle via email; 4 December 2017). Following up related studies (like Lestrelin et al. in this case) can also indirectly demonstrate how institutional approaches to planning and stakeholder participation evolve following a systematic conservation planning exercise and how new knowledge and data can benefit subsequent decision-making. However, it is often necessary to ask authors which studies are directly linked. In contrast to a recent review on the same topic , albeit more limited in scope, our results suggest there is insufficient evidence to claim whether systematic conservation plans are or are not achieving conservation goals. Through application of rigorous systematic mapping methodology, we identified two relevant terrestrial studies which the authors of that review did not appear to locate. However, we concur that more detailed examinations of how plans are implemented in specific regions would be useful and reaffirm statements made by Bottrill et al. in 2012 , “Empirical evidence is not available to support the belief in the benefits of planning”. Other systematic maps and reviews in the environmental sciences have also reported few or no relevant studies, despite also focusing on widely applied, and well-funded disciplines [62–64]. It is important to share such results to illuminate knowledge gaps, limitations with study quality and to avoid duplicating enquiries or assumptions . It is useful for practitioners and decision makers to know when an intervention has not been evaluated to support claims of effectiveness. However, the lack of a consensus on the outcomes of systematic conservation planning does not imply there is no evidence at all. Evidence can take multiple forms, including anecdotal observations from subject experts. For example, the 43 studies which reported the outcomes of systematic conservation planning interventions but which did not meet our rigorous inclusion criteria for study design and/or comparator (Additional file 7) are still valuable to decision makers . Examples of anecdotal outcomes included; “…the initial conservation planning map… has already been used…to block proposed afforestation permits that would have destroyed an area of high conservation value…” [67: 10], and “…pooling of resources, expertise, and capabilities was one of the enabling features in delivery of the new zoning plan…” [7: 1742]. The three included studies were located from different sources, reinforcing the importance of a multi-pronged strategy. The fact that experts in the field confirmed they were not aware of other published studies provided further support for our results (Additional file 1). Therefore, we doubt the inclusion of additional sources, non-English publications or contact with more subject experts would have made a major difference to our results. A test library of eight studies we had expected to be included was used in the design and testing of the search string (Additional file 1 in the protocol ). This test library was also used to test the comprehensiveness of the search results returned after sources were searched and duplicates removed. Six of the test library articles were returned by our searches, two were not. One was an organisational report  so does not appear to have been accessible through the grey literature sources we searched. 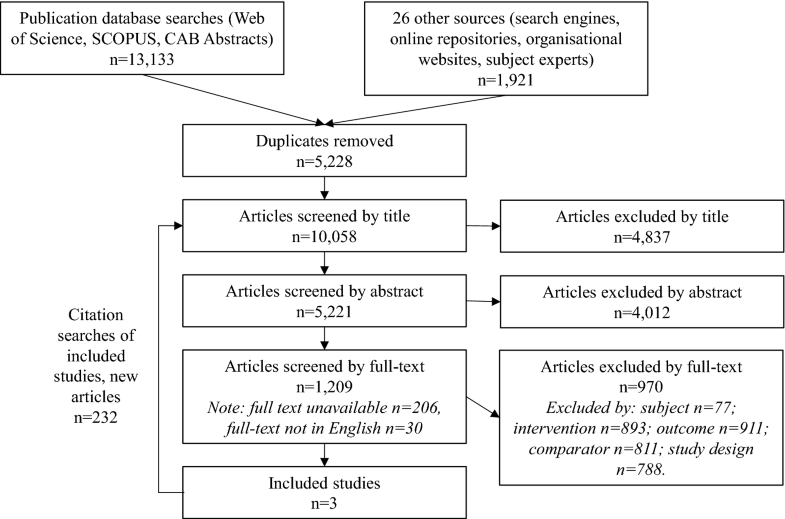 The grey literature is necessarily harder to search (e.g. some databases we hoped to include did not facilitate the mass exporting of search results, Additional file 1). The other test library article  appears to have included subject terms other than those in our search string (this issue is addressed further below). Future revisions to this search strategy should consider broadening the search string. A keyword we recommend for inclusion is ‘ecoregion’ or ‘ecoregional assessment’, a term used by The Nature Conservancy to encompasses systematic conservation planning. These terms were trialled and not included in the search strings because they did not initially appear to contribute additionally to search results. Many ecoregional assessments were returned through our searches, but others may have been missed. Limitations with our chosen subject terms apparently arose from the discipline of systematic conservation planning being relevant to a diverse array of subjects. Without significantly expanding the subject search terms to include a potentially limitless spatial terms (e.g. ‘protection’, ‘natural resource’, ‘forest’, ‘pasture’ and so on), relevant studies may be missed. Excluding the qualifier search terms also works to broaden the results, but a careful balance is required to avoid returning too many irrelevant search results. There is a small risk that literature that does not conform with the academic jargon around systematic conservation planning was overlooked during screening. However, our inclusion and exclusion criteria (Table 5) were specifically designed with this risk in mind, focusing instead on key characteristics of plan design and implementation. During the process of conducting this review we experimented with various technological approaches to increase the efficiency of screening thousands of articles. This included trialling specialised software to manage the screening process . Automated duplicate checking, and web scraping also led to significant time savings. Despite progress in the use of machine learning to help automate abstract screening [70, 71], we concluded this technology is not sufficiently developed to have been applicable without further testing. Innovative methods are much needed, particularly as the size and scope of maps and reviews continue to increase [72, 73]. The lack of rigorous evidence for the impacts of systematic conservation planning is of considerable concern. Additional studies are urgently needed to understand the work of governments and environmental NGOs applying these methods around the globe. A strong assumption from theory is that systematic conservation planning is more effective at conserving species and habitats than alternative approaches to allocating resources for conservation (be they ad hoc, driven by extractive use considerations, or based primarily on stakeholder negotiation). Given the focus on evidence, it is consistent with the epistemology of the discipline to ask whether there is evidence for effectiveness, and to suggest ways in which such evidence might be made more easily available. However, there are many theoretical and practical reasons to believe systematic conservation planning is preferable to alternative approaches (or doing nothing) . The race is on to protect sufficient areas of the land and ocean, increasing the importance of core systematic conservation planning principles like representation of species and habitats, clear objective-setting and well-designed stakeholder engagement . In this study, we confirmed a growing evidence-base for the suitability of different methodological approaches for spatial conservation prioritisations [75, 76]. We also found some evidence of how systematic conservation plans are being implemented, including lessons learnt [8, 67, 77, 78]. However, rigorous impact evaluations are lacking. A full set of guidance is likely beyond the scope of this study, but some recommendations are provided below. To improve the quality of future evaluations of conservation plans, we suggest conservation planning organisations provide incentives and time for staff to write up their findings and make them publicly available (even if not in an academic journal). In addition, conservation planners and academics would benefit from collaborations to leverage the additional resources and skills required to complete evaluation studies. Long-term ecological monitoring and reporting combined with adaptive management  and standardised metrics of management effectiveness [80, 81] are extremely valuable. More examples of ways to improve evaluation in systematic conservation planning are offered by McIntosh et al. .
To improve project documentation, we suggest including: (a) explicit statements about the objectives of a systematic conservation planning process and quantitative or qualitative evidence for whether those objectives were met; and (b) detail about the intervention i.e., how the planning process was conducted, to enable readers to determine whether the process has the attributes of a systematic conservation planning project. To improve evaluation documentation, we suggest including: (a) theories of change about how specific aspects of the planning process were expected to lead to particular outcomes (and where possible, whether results led to a modified understanding of the theory of change); (b) clear descriptions of the study design (with reference to existing classifications e.g. experimental or qualitative sampling ) and discussion about any limitations with the chosen study design; and (c) where possible, presentation of a range of perspectives on the outcomes and potential causal links with the planning process. When designing an evaluation in these contexts, it is preferable to focus on improving the minimum standards of evaluation, rather than expecting to achieve ‘best practice’ evaluation methodologies [48, 83]. Based on our included studies and related literature on barriers to evaluation , the most practical counterfactual study designs for conservation planning are likely to include comparisons before/after the planning process. As a minimum, authors should identify potential alternative explanations (external to the planning process) for observed outcomes and explain their understanding of the relative importance of different potential causal processes. Examples include stakeholder perceptions of the relative importance of a local election in promoting political action, or a natural disaster having reduced interest in planning versus on-ground action. For more see McIntosh et al. . Given that systematic conservation planning constitutes a form of ‘dynamic planning’ , dynamic approaches to evaluation may also be necessary. This could include elements of development evaluation, where an evaluator is integrated with the design team . These styles of studies are not impossible to undertake or report on. An increased uptake of before-after and with-without designs in the conservation policy field has been reported by conservation experts . In one of our included studies, a temporal comparator was employed using historical land ownership records. This type of analysis is likely to be feasible in many conservation planning scenarios, particularly where the use of experimental study designs and controls would not be cost effective or ethical. During full-text screening we encountered several interesting study designs and uses of comparators that have been undertaken in related disciplines. For example, qualitative case study evaluations compared different planning approaches in a single region [45, 85], and another compared two neighbouring regions, one that participated in a community zoning project, and another that did not . In the short term, it is unlikely that enough new studies will be produced to warrant a revision of this systematic map. Future research may consider exploring the evidence for the effectiveness of specific aspects rather than evaluating systematic conservation planning in its entirety (e.g., stakeholder attitudes of consultation processes). Remarkably few rigorous evaluations of systematic conservation plans have been conducted to date, despite many claims about their effectiveness. This does not imply systematic conservation planning is, or is not, effective, but highlights the gap in our understanding of how, when and why it may or may not be effective. It also raises important questions about the challenges of conducting rigorous evaluations in relation to a non-linear and multi-dimensional intervention such as conservation planning. We have provided some suggestions as to how these challenges can be overcome. We recommend more focus is required in this area. We urge academics and practitioners alike to publish the results of systematic conservation planning exercises and to employ robust evaluation methodologies when reporting project outcomes. This study was led by EJM. The research question was independently conceived by MCM and RLP, who advised throughout the project. Title screening was conducted by EJM and SC, abstract screening by EJM, SC, SGK, BW, GA and JPRT, and full-text screening by EJM, SC and SGK. Full-text coding was conducted by EJM and BW. RG advised on the design and execution of the study. All authors read and approved the final manuscript. We thank Christian Kohl and Stefan Unger their assistance with CADIMA and Jeff Brunton and Zak Ghouze for their assistance with EPPI-Reviewer. Discussions with Jorge G. Álvarez-Romero improved the data extraction categories and Neal Haddaway and Gillian Petrokovsky advised on systematic mapping methodologies. This manuscript has also benefited greatly from the comments of two anonymous reviewers. All data generated or analysed during this study are included in this published article and its supplementary information files, which will be made available for download from the Environmental Evidence website. Permission has been granted for all direct quotes and personal communications included. EJM is supported by the General Sir John Monash Foundation. RG thanks the John Fell Fund of the University of Oxford and Jesus College Oxford for support. RLP acknowledges the support of the Australian Research Council. 13750_2018_134_MOESM1_ESM.xlsx Additional file 1. Detailed search methods and results. 13750_2018_134_MOESM2_ESM.xlsx Additional file 2. Coding template and included studies, coded. 13750_2018_134_MOESM3_ESM.xlsx Additional file 3. Forward and backwards citation searches of included articles. 13750_2018_134_MOESM4_ESM.docx Additional file 4. List of articles unavailable at full-text or unavailable in English. 13750_2018_134_MOESM5_ESM.pdf Additional file 5. List of articles excluded at full-text stage, including reasons for their exclusion. 13750_2018_134_MOESM6_ESM.docx Additional file 6. Review articles excluded at full-text screening. 13750_2018_134_MOESM7_ESM.pdf Additional file 7. List of articles included on subject, intervention and outcome, but excluded on comparator and study design. 13750_2018_134_MOESM8_ESM.xlsx Additional file 8. Retrospective tests of initial search string. Watts MEJ. Global users. Marxan.net. 2018 http://marxan.net/index.php/globe. Accessed 3 Apr 2018. EPPI-Centre. Export your search file to RIS format. http://eppi.ioe.ac.uk/cms/Default.aspx?tabid=2934. Accessed 8 May 2018.